Cooking in plastic is a major sous vide safety concern. The other large safety concern with sous vide has been studied in much more detail and deals with the propagation of bacteria at various temperatures, especially salmonella. Salmonella only thrive in a certain range of temperatures, from about 40ºF to 135ºF, often referred to the "danger zone". This danger zone is why we refrigerate our foods until an hour or so before we are ready to cook them. It is also why we cook our foods to specific temperatures before we eat them. The biggest misconception about bacteria and the danger zone is that any food in the temperature range is not safe and as soon as you move above 135?F the food instantly becomes safe. The truth is that the bacteria begin to die in direct relation to the temperature they are exposed to. The best way to visualize this is to think abot how we humans react to heat. We do fine in climates where the temperature is below 100ºF degrees. However, once it begins to climb around 110ºF or 120ºF you begin to hear about deaths in the news due to heat stroke. If the temperature were to raise to 200ºF stepping outside for more than a few seconds would kill you. Bacteria behave in the exact same way. They begin to die at around 135ºF and 165ºF just about instantly kills them. You can see this in the chart below for 1% fat chicken. 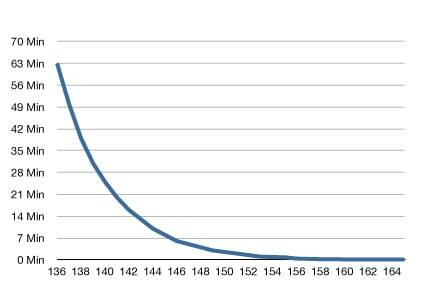 The bottom axis is the temperature the chicken is held at and the left axis is how many minutes at that temperature are required to bring the bacteria to safe levels. This concept is why the USDA recommends that chicken is cooked to 165ºF, because at that temperature it takes only a few seconds for enough bacteria to die to achieve acceptable safety levels. In comparison, at 136ºF it takes 63.3 minutes at that temperature to achieve the same safety level, something that is virtually impossible using traditional cooking methods. Using sous vide makes it possible to heat chicken to an internal temperature of as low as 136ºF and hold it there long enough to kill the bacteria. Please remember that this is assuming that your thermometer is exact and the sous vide water temperature is completely steady. I recommend always cooking foods at a little higher than the minimum temperature and a little longer than the minimum cooking time in order to account for any variance in temperature your equipment causes. For more information about how long chicken, poultry, and beef need to be held at certain temperatures please refer to the USDA Guide. For more explanations of how this works you can reference the excellent guides by Douglas Baldwin or Serious Eats.